Billing checks and bill runs for recurring charges. First and foremost, perform a billing check, as shown in the guides above, for BOTH ad-hoc and recurring charges. To create a bill run for all of your charges, start by going to Invoicing > Bill Run. Click Start a Bill Run. Select the charges you want to bill or leave all of them checked. This will bill all of the ad-hoc and recurring charges within the billing period. Save your options as a template by clicking the button below the list of charges. This will help you run future bill runs much faster. Name your template and click Save. Next time when you need to add the same type of charges, you can select the template from the start bill run screen. Select Charge Sets by first choosing a date range for charge sheets - we suggest selecting the 'Up Till Now' option if this is your first bill run For future bill runs, we suggest selecting the period that has passed since your last bill run. There are preset intervals already available and you can also set a custom date range. Next, select the customers you want to bill. You can choose to bill your entire customer base at once; or choose specific accounts. Select Batch Sheets/Bookings by selecting a date range as well. Typically, this date range should coincide with the one you have selected for charge sheets. 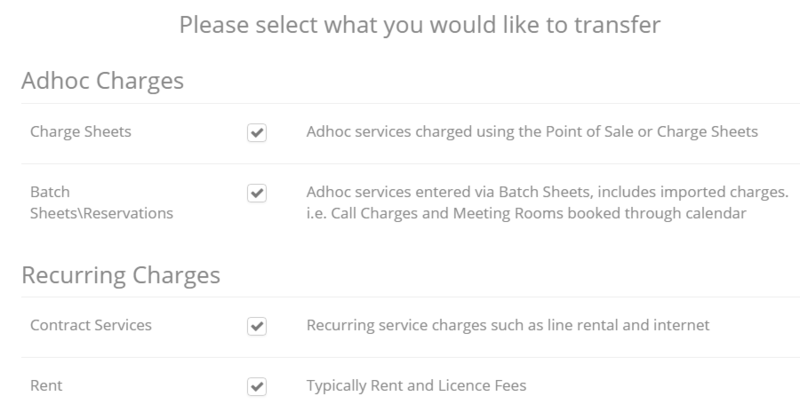 Select customers - Once again, this should be the same as for charge sheets; then select a batch -.You can choose to bill one specific batch of charges; or more; depending on what you need. Select Services - Select a Date Range. The date that you select here represents the last date of the current billing period. This means that your billing period extends from the last bill run to the selected date. Below the Date Range, choose the contract services that you want to bill. Click Next to proceed. On the next screen, go through the same steps to select rent fees to bill. Complete the Bill Run - You can choose whether to run the Bill Run in the background and be notified when it has completed, or wait on screen while it runs. By default it will run in the background. Unselect the check box if you would prefer to stay on the page while it runs. Please read the on-screen warnings to make sure that nothing unintended occurs. Click the Finish button when you are ready. If you have chosen to let the Bill Run take place in the background, you will receive an email and be notified on screen when it has completed, along with a link to view your Draft Invoices. If you do not choose to run the process in the background, you will be asked whether you want to display draft invoices after transfer. This will take you to the invoice preview screen right after the bill run completes, without sending you any notification. Once you start the Bill Run process, Operate will show the screen below. You do not need to stay on the page - you can navigate away from it and perform other tasks within any area of Operate, including another bill run. The system will not slow down while processing. You will be notified by email and on-screen when it is done. You will then see a list and preview of all of your invoices. You can select each invoice and make sure that they are correct and are numbered consecutively, taking into account the prefixes that you have configured. If you are happy with how it all looks, set a Due Date and Invoice Date, then click Approve All to approve your invoices. Once approved, your invoices are ready to be sent to your customers. If you have a few invoices and want to send them manually, you can select each one and use the Print or Email buttons to either open a print window or an email editor respectively. If you have a large amount of invoices, you can use the Automatic Invoice Production button, which will either print or email invoices, according to the preference set on each customer's account. If the invoice will be emailed, your customer will receive an email (read more on how to configure this email). If the invoice will be printed, you will see separate browser tabs which will allow you to print the invoice for each customer who prefers so. Click Close when you have finished your bill run process. 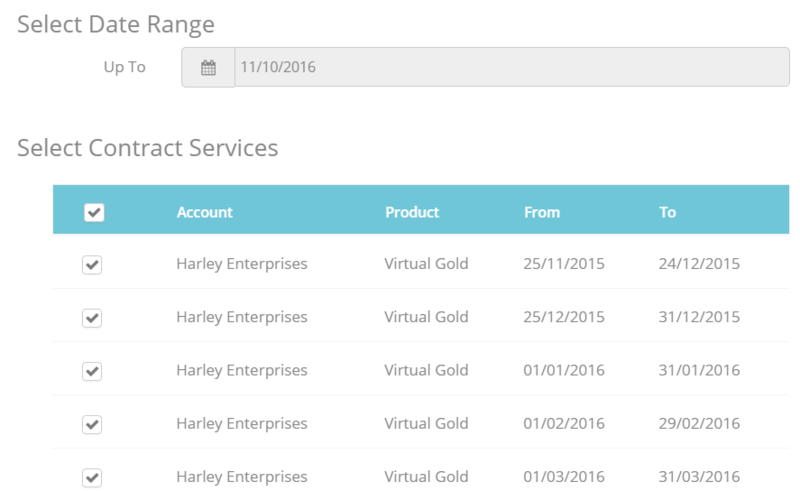 All approved invoices will now be available under Invoicing > Invoices.